See whether or not your ISP’s DNS server is faster or slower than other alternatives like OpenDNS or Google Public DNS with Namebench. 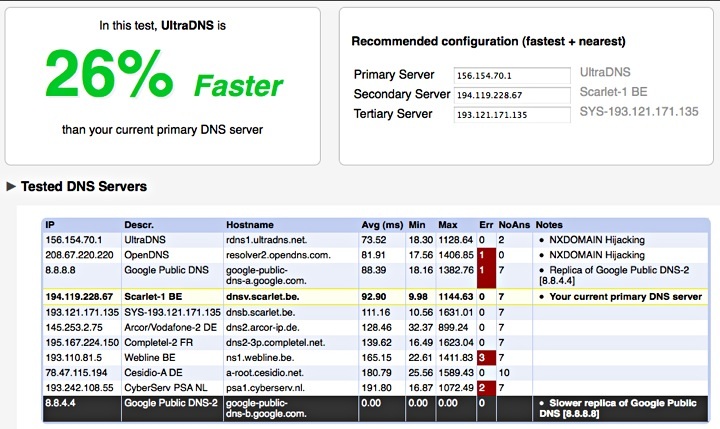 This free benchmarking tool pits your current DNS servers against alternatives and generates handy charts and recommendations for which of your DNS choices are the fastest. Using either your browser history or Alexa’s top 10,000 global domain names, by default Namebench runs 200 tests to see which resolve most quickly using regional DNS servers, public services like Google’s and OpenDNS’s, and your current DNS services. Here’s what some of the benchmark results look like. Namebench is a Google “20% project” and is a free download for Windows, Mac, and the command line. The benchmark tests take several minutes to run, depending on how much data you throw at it, so be prepared to go make yourself a sandwich after you press the “Start Benchmark” button. When I ran Namebench, I didn’t get full results because the alternate services timed out, but I’m pretty sure that’s because of restrictions on my network. What about you? Does OpenDNS or Google Public DNS beat out your ISP’s DNS servers? Thanks, Vince! DNS Benchmark also works quite well http://www.grc.com/dns/benchmark.htm – it works in Windows and in Linux (under Wine).